Goodmorning everyone! 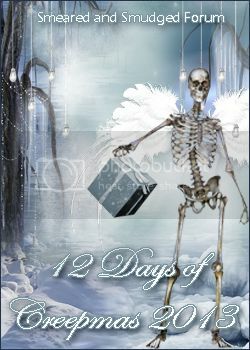 I'm here to share with you my creation for the day 19th of 31 days of Halloween going on over at Delicious Doodles Blog. For my creation I decided to make a little decoration for my house and I used the awesome Grim reaper. I used a shadow frame that I purchased at the dollar store! I removed the glass so that it would be better to take some pictures. I printed the image a few times to be able to give some 3d effect to it. The background paper is from DCWV - The midnight spell pack. 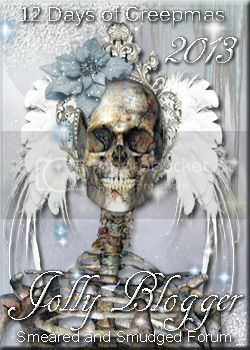 I used some stickers from the Jolee's boutique. I added some bats that are little confetti. I found those also at the dollar store. Here's a closer look at the digi colored with my copics many many times! And here's a side view so you can really see the decoupage that I did. That's it for me for today! I'm busy today being a taxi driver lol ;o) Hope you have a great crafty day!!! Spooky and fabulous!! Very creative to make this into a shadow frame! yet another great entry to our Halloween challenge! Beautiful!! Thank you for joining Left of Center - again!